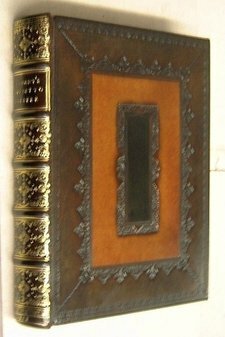 One of 5 private investment libraries I am building and restoring at present is a medium sized specialist library for an eminent heart surgeon, who insists every 16th - 18thC book is restored and re-bound purely in my version of the Cambridge panelled calf binding using "The lost wax method". 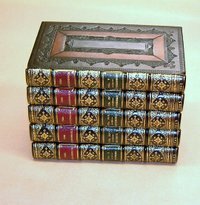 Half of the library will consist of important "Chirurgicall" Treatise from the 16thC to the early 19thC the other half will be of a varied topic of 16th - 18thC first editions and topped off with a complete set of 1st edition and 1st issue Dickens uniformly bound in a deluxe style of the period. 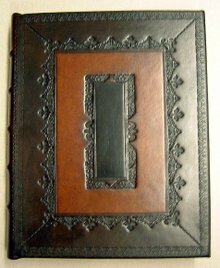 Of all of the different styles of bookbinding throughout the centuries (I practice more than 70 styles) the "panelled" calf is the one I always find aesthetically pleasing. Supposedly started in Cambridge University in the early 17th Century it soon became their trademark style with simple line tooling around a middle and darkened centre panel and a lightly speckled middle panel this style is timeless if executed in the proper manner. 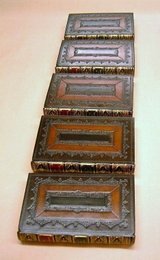 Creative book binders combine various ornamental tools to achieve numerous variations in book decoration. 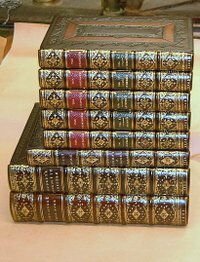 Bindings can be dated by the type of ornamentation used, with rococo ornaments common in the seventeenth century and classical Greek key borders popular for eighteenth century bindings. 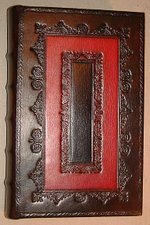 In some cases, individual binders ( like myself ) or workshops are recognizable by their distinctive tools and craftsmanship. 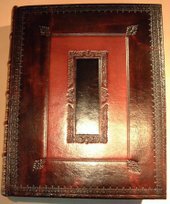 It can be very difficult to match the colours of the period as most of them were chemically applied, the book would be bound in a natural calf and then paste washed to prevent the chemicals penetrating the skin. The skin is then washed with picric acid, a highly volatile compound that gives an even yellow reflective colour, this is changed to a medium tan by washing with "salts of tartar" (potassium tartrate). Although I still practice the chemical applications a much safer method I use is by fermenting vegetables and vegetation extracting the pectins, colour and tannin, the spice turmeric is virtually the same yellow as picric acid, oak bark gives a mellow brown, horse chestnut is much darker, crushed green walnuts or ferrous sulphate for black, Brazil dust, woad, earth boles and pigments, cochineal , cherries, beets, more like a shopping list really. I've even boiled mahogany chippings and extracted the most amazing colour. 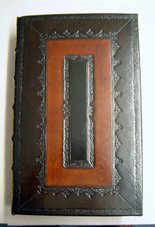 To begin this style of book binding the book is flexibly sewn on raised cords with laced-in boards which are splayed out and secured within. 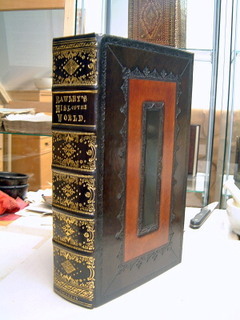 The book is then bound in a natural vegetable tanned calf, the dyes having been strained and prepared earlier, the edges and spine are coloured before turning in. I usually "cap" the edges of the book before colouring, to prevent any accidental splashes marking the edges. After applying the colours I make a "tallow" compound of bulls fat and other properties and coat the whole of the book, this prevents the hot tool from scorching the surface of the skin by cooling it slightly, it also acts to burnish and blacken the impression the tool leaves behind. 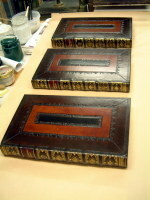 The edges of the boards and the inside edges are also blind tooled before the end papers are pasted down. 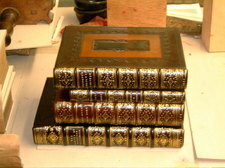 The tallow is removed and the book is polished with a hot iron and prepared for gilding. The spine of a Bible this size will take up to 1000 impressions of tools in gold leaf. 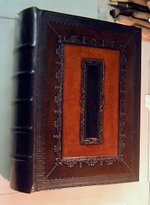 Through every period of book binding since the early 1600's the Cambridge panelled calf has been one style of book binding that has always retained an air of quality and craftsmanship whether they are single large folios, multiple volumes in folio, quartos, octavos on whatever subject. 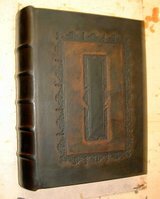 The versatility of the Cambridge panelled calf is such that the tooling may look similar or even the same until you match two different volumes together and find either complete differences or a subtle variation of the same tooling.....This particular client is so enamoured with the style and requested slight variations in the tooling for their own books....A serious library can be identified by specific tooling. 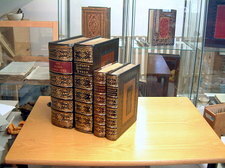 The images shown are my own personal variations for rare books that warrant a finer binding. 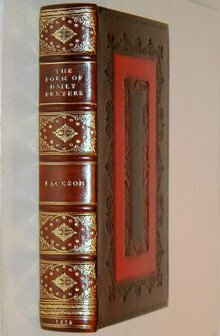 Large family Bibles, historical books, theology, natural history, every subject printed on a quality paper has been embraced by this quality style of book binding. 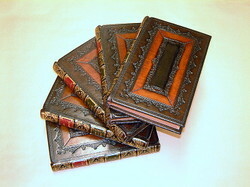 Folios Quartos and Octavos in different depths of browns, reds and blacks, some speckled some not, but all looking and feeling quite authentic in their new bindings.